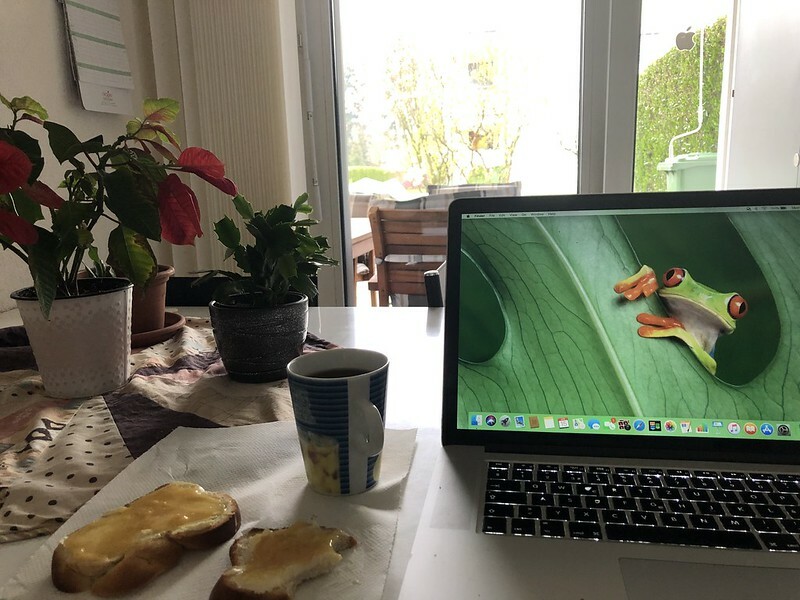 Everything ready for the week to begin: bread and honey, a cup of tea, a computer, so what could possibly go wrong? The weather is a bit dull, but even that can get better, I hope. It is now Easter week the worst week in the year together with the Christmas week. Yesterday I did a mastermind of planning meals until next week on Tuesday morning. I go shopping on Monday, Wednesday and Friday afternoon, but this week we have no Friday afternoon because of this holiday called Easter and the shops are then closed. Monday is also closed. And so I have to make sure the family Angloswiss does not starve. It will be a long week-end of frozen food and that which can be kept in the fridge. I do not intend to commit shopping suicide on Saturday afternoon to buy until Tuesday lunchtime and so I really have a marathon to complete this week. I really hate these holidays, such a stress. I have a triple list of shopping. Items that I can already organise because they will live for a week in the fridge or home, items for Wednesday which are limited in time but just a matter of a few days, and Thursday. I know Thursday is not my shopping day, but I have no choice. Friday is a no go, and so I must get together the remainder on Thursday afternoon. I dread the battle for a parking space. Generally no problem as I have a permit for spaces for the handicapped. It just seems on such holidays when all are shopping being anxious that they will starve from malnutrition on the holidays, that suddenly everyone is handicapped and take the places from those that need them. So let’s have another photo to brighten up the misery of Easter. 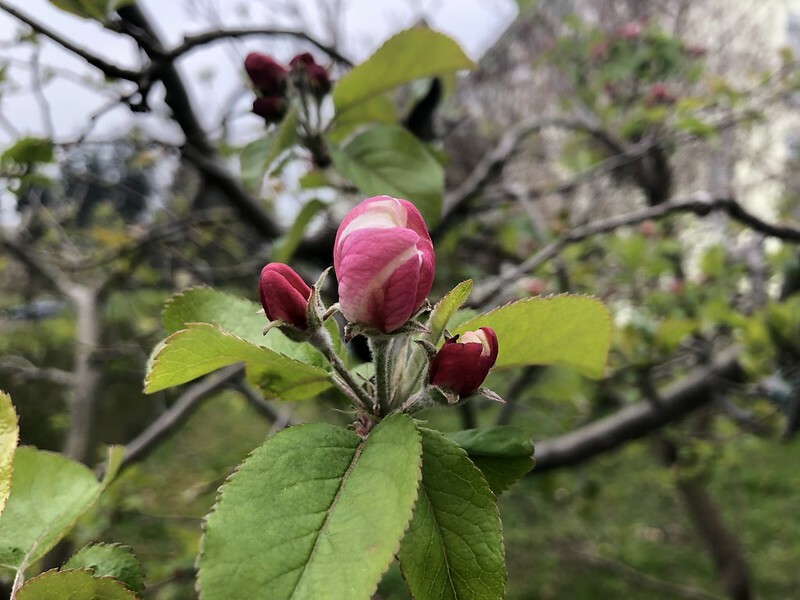 My apple tree is making proress and the buds are now beginning to open. The tulips are still opening and closing and the hyacinth is still there in the middle. 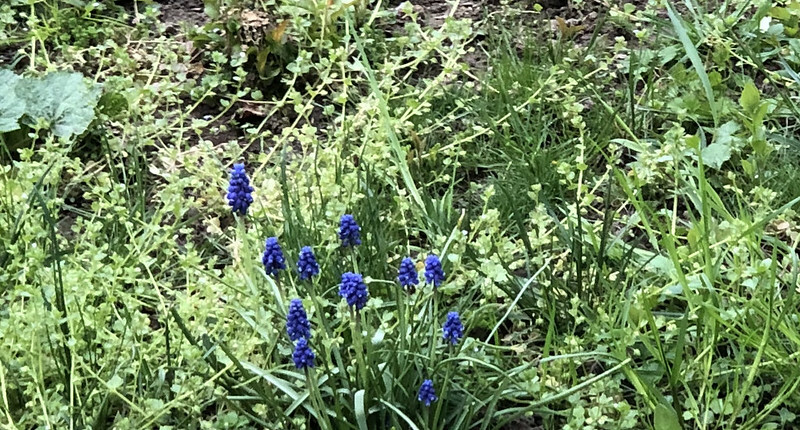 I also discovered a small group of grape hyacinths at the edge of my garden. I am sure the gardener did not put them there, and neither did I. Was it a magic appearance? I did have some grape hyacinths in the my garden before the renovation and I can only imagine that the gardener shifted a clump of earth containing the corms to the edge of the garden, not realising that they were still sleeping in the earth. And that is the beginning of what will be a miserable week. Tomorrow afternoon I also have to go to my garage to have my summer tyres put on the car: another interruption to my peaceful and calm routine. In the meanwhile I have eaten my breakfast and will move on to a shower and clean up of the home. I so hope your week will not be filled with such misery as mine will. I seem to celebrate this Easter thing with shopping excursions and logistics. 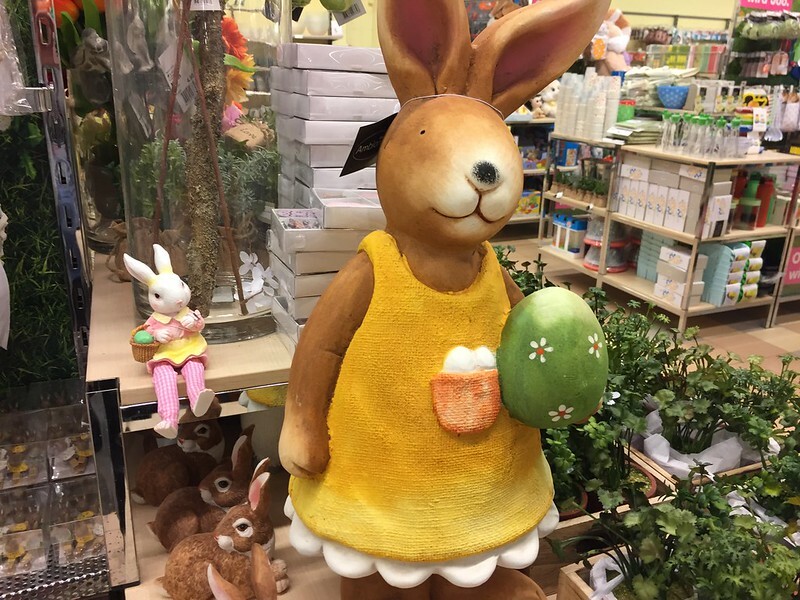 Chocolate easter eggs and easter bunnies? Forget it. I told the family if they really want them, then to organise it theirselves online or otherwise. 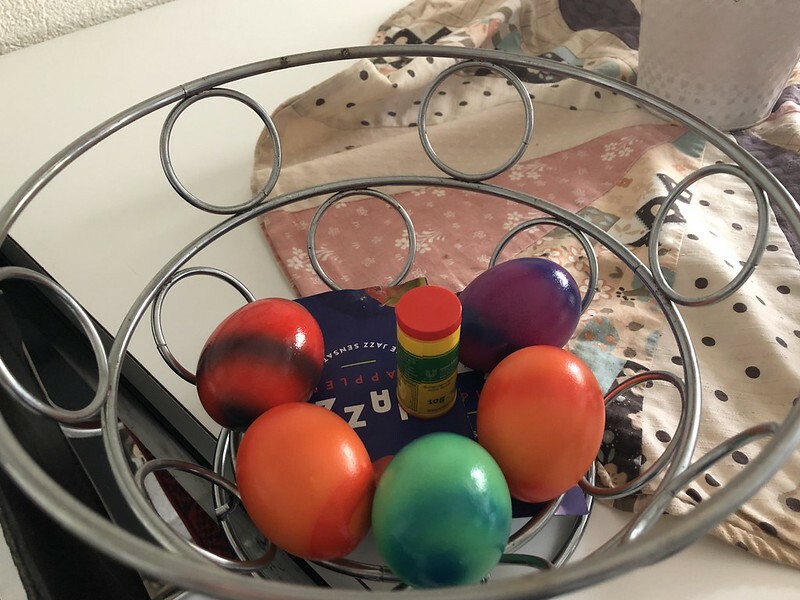 I do have some painted Easter eggs. I bought them in the store and they even included a mini pot of Aromat with them as a spice: Aromat the Swiss spice that no Swiss can do without on the food. No I do not colour the eggs myself. I did that when the kids were still kids, a terrible waste of time, but they had fun. I hated it. So enough of Easter grinch, I am just glad when the whole thing is over. Make the most of the week on your battle through the trials and tribulations of Easter. Good Morning. I have not gotten to yesterday morning yet. It is just past midnight, and I must get some sleep. I am at a conference right now, with some rather posh accommodations. Anyway, I am sorry that Easter is so unpleasant. I dislike it too, but for completely different reasons. It is such an important Holiday to me, so all the stupid traditions are very insulting. If I complain, people think that I am the one with the problem. People really need to invent their own stupid holidays, and leave mine alone! Okay, enough of that rant. The grape hyacinth are rad. They can naturalize here. I don’t see them much any more. There are new and improved cultivars now. When I grow them, I will find the old traditional sort that I remember. Being an atheist, I do not need this sort of holiday. Too much fuss and stress. I really did not expect my grape hyacinths to survivemy new garden, but they did.. There is not much that grape hyacinth will not survive. They are RAD! The Conference is done now. It was not as great as everyone told me it would be, but I am not trying to publish a book like they are. I have been writing my gardening column for twenty years, so I do not need to be told how to do it by someone who started out a few years ago. I really dislike all the politicking that goes along with such events; just like college. Goodness! Now I am even MORE behind. It will take days to catch up. I am back at work today for the first time in a week. I did not work Friday last week. Nor did I work yesterday, Wednesday, like I normally do. It’s a real struggle. Catering during holiday periods really is a stress when you are handicapped. The apple blossom is beautiful, how old is your tree? I have two, one in a pot, that are going on 2 years old at the moment – no flowers though. We don’t celebrate any religious holidays, though every once in a while, Garry thinks he should go to church … but getting up that early in the morning just doesn’t work for him. When the whole family was living here, we used to make Easter baskets for Kaitlin and have a nice dinner, but that was pretty much it for us.